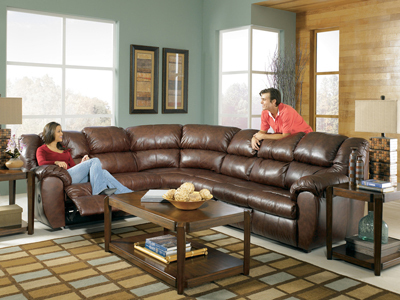 Leather Match motion upholstery in Sonoma leather, offers a soft hand with the benefit of protection. This cozy style offers casual contemporary styling with plush pillow arms and chaise pad. With durable reclining mechanisms throughout this upholstery collection, this stylish group is perfect for any family room or entertainment area. Sonoma leathers light surface correction allows for visibility of natural leather grain. Subtle two tone effect enhances color depth and vibrancy. Waxy finishing additives enhance the skin-like touch of this leather. Sonoma is a Protected Leather and is perfect for active households.